Note: Cell service is limited (if available at all) in the Ludlow area and GPS is not always reliable. Olmsted Manor Retreat Center is located on US Route 6 in Northwestern Pennsylvania, in the village of Ludlow, surrounded by the Allegheny National Forest. We are 20 miles east of the town of Warren and 9 miles west of the town of Kane. Traveling to Olmsted Manor, guests can enjoy a scenic drive from all directions: Erie, PA (about 90 miles), Pittsburgh, PA (about 150 miles), or Buffalo, NY (about 110 miles). Olmsted is about 60 miles south of the I-86/NY 17 exit for Route 219 (exit # 23) at Bradford. Take Route 219 South to Route 6 at Lantz Corners. 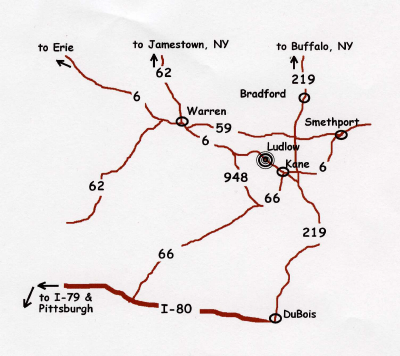 Take Route 6 West through the town of Kane to Ludlow. The Olmsted Manor buildings are on the right, watch for our signs with the Olmsted staghead logo. Olmsted Manor is about 60 miles north of I-80 at the DuBois (Rt 219) or Shippenville (Rt 66) exits. If you are traveling west on Interstate 80 take the exit for Route 219 North (exit #97), travel north through DuBois to Wilcox where you will take Route 321 North to Kane. In Kane you will turn left onto Route 6 and travel West to the village of Ludlow. The Olmsted Manor buildings are on the right, watch for our signs with the Olmsted staghead logo. If you are traveling east on Interstate 80 take the Shippenville exit, Route 66 North, (exit # 60) and travel north to the town of Kane where you will join Route 6.